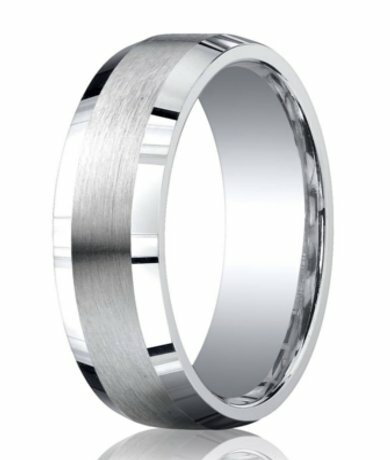 Sleek and sophisticated with a modern twist, your groom is sure to love our 7mm designer Argentium silver polished edges wedding ring with satin finished center. It is one of our most exquisite designer bands, with a flat satin-finished center with beveled edges that really shine. Men who want a high-quality traditional wedding band will appreciate the clean lines and smooth fit of this elegant ring. However, it has just enough of a modern twist to keep you from falling into the pattern of traditional. Instead, it's the perfect blend of modern and classic. We recommend visiting your local jewelry store before placing your order to get your groom's finger sized. Comfort fit rings tend to run ½ size smaller due to the additional metal inside the ring. Our 7mm designer Argentium silver polished edges wedding ring with satin finished center may look like an exclusive ring celebrities wear, but the price is surprisingly affordable. We offer only high-quality pieces, so you don't have to worry about it holding up for years to come. We even offer custom engraving of up to 30 characters. My husband loves this comfort fit ring, great quality, and friendly customer service should you have any questions. I would purchase from Just Mens Rings again and highly recommend anyone shopping for a ring for the man in your life to shop JustMensRings. Got the ring in perfect timing, sales rep was really nice with information. Only one thing i had a bit of disappointment with, was the engraving. It came out in a straight font rather than curved/ slanted.